High Quality Content by WIKIPEDIA articles! 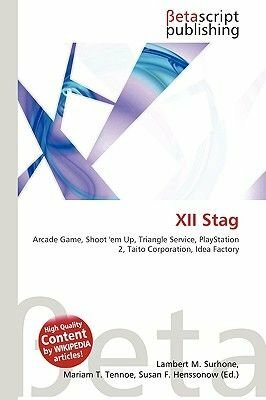 XII Stag, is a shoot 'em up arcade game developed by Triangle Service and published by Taito. It ran originally in Taito's G-NET arcade board, and was ported to the PlayStation 2 console. Digital Bros published the port in Europe; however, the game was not released in the USA. It is a 1-stage demo of the game that includes Stage 4 of the original game. Full-screen and windowed executables are included. Unlike the original, the objects are 3d objects rendered in software. It is a version for Windows Mobile platform. It includes 5 difficulty settings from very easy to very hard, original soundtrack.